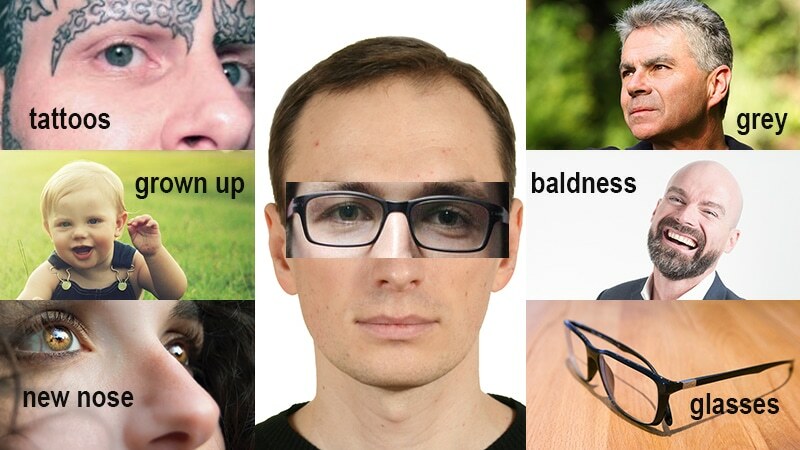 APH Community > Passport photos: I’ve grown a beard, put on weight, gone bald, had a tattoo and more… do I need to report it? Nature dictates our appearance will change over time, but when do we need to inform the passport agency and submit a new photo? What physical appearance changes need to be reported to the Passport Office? From beards to glasses and baldness, there are many ways our appearance can evolve over the ten years our passport photo is active – but do we need to report these changes to the Passport Office? Here’s the information you need to ensure you don’t get marooned at immigration. Many of us will dye our hair, or simply find it turns to grey, but will this change need acknowledging on our passport photo? Do I need to report the change? No. The colour of your hair does not impact on your passport photo. The biometric information – which helps digitally identify your face – does not include the colour of your hair. So, feel free to apply the dye, or simply go grey gracefully. Hair loss can be gradual or rapid over just a few years, but will a lack of the stuff require a new passport photo? Or what about a decision to finally shear that bubble perm you’ve been nurturing since the 80s? Do I need to report the change? No. Once again, your hairstyle – or lack of it – will not confuse the biometric data, or the security officer at the airport immigration desk. From a small goatee to a full-face covering, beards can drastically change your appearance, but will they give you a close shave with an airport immigration officer looking at your clean-shaven passport image? Do I need to report the change? No. Passport guidelines implicitly state that growing a beard does ‘not’ need to be reported. Have you added or removed facial tattoos or piercings? Could it affect your passport photo? Do I need to report the change? Yes. You will need to report the changes to the passport office, which is likely to advise a new photograph is required. Most adults will put on between one and two pounds each year during their adult life. For some, the weight gain will be far more severe, but will your extra bodyweight mean it’s time to visit the passport photobooth? Losing weight can also be a concern for travellers worried about their passport. Do I need to report the change? If the weight gain or loss is just a few pounds then there’s no reason to report the changes. However, extreme changes could change the structure of your face which might corrupt biometric data. If you have lost or put on a large amount of weight, you should contact the passport office for advice on your appearance. Either through medical conditions or age-related degeneration, our eyes will deteriorate and it’s likely we’ll need to wear glasses at some point in our life – even if it’s just for reading or driving, for example, but will you need to get a new photo with you wearing them? Do I need to report the change? Luckily, this is clear. The answer is no. The passport office does not like glasses being worn in photographs, so there won’t be any need to update your picture for this change in appearance. From having a nose job to facelifts or reconstructive surgery after trauma or illness, many will want to know if they need to update the photograph on your passport. Around 30,000 people had cosmetic surgery in 2016, so it’s a real concern. Do I need to report the change? Facial cosmetic or reconstructive surgery is likely to alter the structure and ‘mapping’ of your face, which will, in most cases, leave your biometric data incorrect. This, along with differences visible to the naked eye, will leave you at risk of having an invalid passport. You will need to report such changes to the passport office. Your child may have had a passport photo taken at just a few weeks old, so by the time the passport runs out five years later, it’s likely they’ll look rather different. But will you need to get a new passport photo when you can no longer compare the child with the one in in the passport pic? Do I need to report the change? No. Despite the transition from infant in arms to toddler creating a huge change in appearance, the immigration officer will simply ask additional security to the parent/guardian, and even the child. Disclaimer: If you believe your appearance has significantly changed, please contact the Passport Office for advice.